Have you ever wanted to create your own version of an eye chart? VSP Vision Care, the nation’s largest provider of eye health benefits has created an eye care education website that features an activity that will let you create your own Print-and-Color Eye Chart. It lets you create a custom eye chart with any message you like! It’s a spin on the classic eye chart (the one a giant ‘E’ at the top). Below is an example of one for the holidays! This is something the whole family can really enjoy – kids can put their name in the chart, or something like ‘Happy Birthday’, then color it in and hang it on their wall. Parents can even make a chart with a special message, stand 20 feet away, and test their kids’ vision! 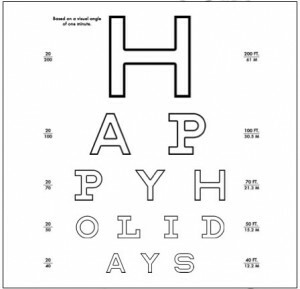 Click below to view and print the Happy Holidays Eye Chart full size or go create your own at http://eyechart.seemuchmore.com/.